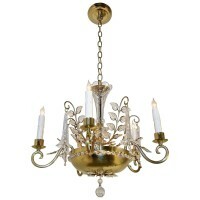 Dish form chandelier in the style of Maison Bagues. Lighting includes five-arm candles and interior lights that illuminate the pierced brass dish. Center column is surrounded by crystal leaves with hanging crystal fluted vase shaped strands. Uses five total 40-watt candelabra size bulbs for the arms and 3 – 15 watt max bulbs for the interior lights. Interior lights can be turned off by the crystal pull chain. Newly wired. Overall height including chain and citing canopy 37″ and be adjusted to suit. Diameter 20″.